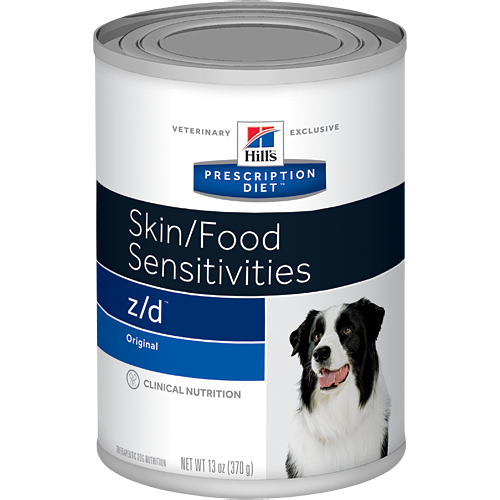 Food sensitivities and intolerance are potentially serious problems that can result in sensitive or irritated skin, coat and ear conditions or even gastrointestinal upset. Dogs that have a food sensitivity or intolerance, also called adverse reactions to food, typically experience an abnormal response to the protein in the food. If your dog suffers from adverse reaction to food, it is even more important to feed the right food. 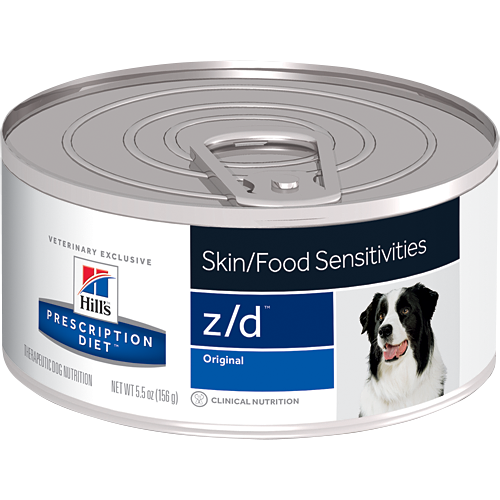 Hill's nutritionists & veterinarians developed Prescription Diet® z/d® clinical nutrition especially formulated to support your dog's skin and food sensitivities. In fact, z/d is clinically proven nutrition to help avoid adverse reactions to food. Water, Hydrolyzed Chicken Liver, Corn Starch, Powdered Cellulose, Soybean Oil, Dicalcium Phosphate, Potassium Citrate, Calcium Carbonate, vitamins (Vitamin E Supplement, Ascorbic Acid (source of Vitamin C), Niacin Supplement, Thiamine Mononitrate, Vitamin A Supplement, Calcium Pantothenate, Biotin, Vitamin B12 Supplement, Pyridoxine Hydrochloride, Riboflavin Supplement, Folic Acid, Vitamin D3 Supplement, Menadione Sodium Bisulfite Complex (source of Vitamin K)), DL-Methionine, Choline Chloride, Iodized Salt, minerals (Zinc Oxide, Ferrous Sulfate, Copper Sulfate, Manganous Oxide, Calcium Iodate, Sodium Selenite), Taurine, Magnesium Oxide, L-Threonine, L-Tryptophan, Beta-Carotene.